Jasmine French (Cate Blanchett) moves from her upper class life into homelessness and poverty due to her husband's illegal business leading to all her properoties, possession and wealth being taken away from her. Moving in with her sister Ginger (Sally Hawkins), Jasmine tries to get her life back on track by taking classes and aspiring to become an interior designer. However, constant conflicts with Ginger's boyfriend Chilli (Bobby Cannavale) and her deteriorating mental state prove difficult in Jasmine's life. To be frank, I only watched this film due to Blanchett taking the Best Actress honour at pretty much every award ceremony right now. The trailers were hardly enticing whatsoever, and the whole "Upper Class Person Thrown Into Lower Class Life" is hardly original either. However, Blue Jasmine is a far better film than one might expect. Blanchett truly is terrific here, and I can safely say she really does deserve these awards she's taking. Does she deserve them more than Bullock for her work in Gravity? Right now, I'm not sure. Blanchett's character here is more relatable, but in terms of acting quality I think Bullock has the edge. The acting all round is exceptional, really. Hawkins could easily take Supporting Actress any other year, but up against such strong competition from Jennifer Lawrence and Lupita Nyong'o, it seems less likely to be her year. The majority of this film's success lies with Woody Allen's script and direction. Whilst the plot is a tad too conventional and not all of the characters feel fully rounded (Ginger's two children are pointless, and ex-husband Augie is never really convincing), Allen directs his cast with the emotion required, and allows them to fully perform his fantastically written script. 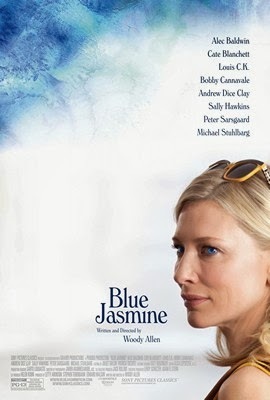 As a drama film, Blue Jasmine suffers a relatively short running time at just 96 minutes; as the credits began rolling after the film's extremely emotionally complex final scene I actually wanted the story to carry on for another ten, maybe twenty minutes. However, this film is at its best in its second half; a scene in which a major argument breaks out between Jasmine, Ginger and Chilli in Ginger's apartment is a true highlight. Blue Jasmine may not be the most memorable film to come out last year, nor is it the most original, but Blanchett's Jasmine was such a watchable character, she carries this film on her shoulders with ease. Blue Jasmine belongs to her. Allen's direction is as strong as ever, but there was something about this film that didn't feel fully realised. Blue Jasmine is a very strong film, and it's emotionally powerful, but there's just something missing. To Summarise: It lacks originality, but "Blue Jasmine" is an emotionally enabled drama, supported by an incredible performance from Cate Blanchett.